To suggest an item for inclusion on this page, please contact us. Air India Disaster Memorial, Ahakista. Ahakista is on the southern shore of the long West Cork peninsula of Muintirvara. The monument is in a field, on the foreshore washed by the waters of Dunmanus Bay, where, on June 23, 1985, an Air India plane crashed en route from Toronto and Montreal via London to Bombay. 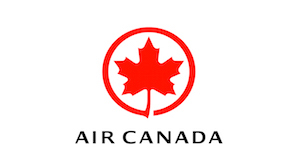 All 329 people on board, mainly Canadians of Indian origin, lost their lives. Cork artist Ken Thompson chose a sun dial as the main focus of the monument because he felt it suggested the "wheel of life" and provided a common symbol of the diverse cultural and religious backgrounds of the victims." On June 23, the sun shines on the sundial at exactly 8:23 a.m. the time the disaster took place. Relatives and friends can lay wreaths at this site of solace. An annual commemoration takes place there every June 23. There are several Canadian expressions of thanks to Ireland for the help given in the aftermath of the Air India disaster: two plaques, one in the main square of Bantree and one at the front entrance of Cork Hospital in Cork; and an Inukshuk in the main lobby of the Cork County head office building in Cork. Thomas D'Arcy McGee plaque, Inishowen. Irish-born McGee is sometimes called Canada's most eloquent Father of Confederation, following upon his famous 1860 speech "A Prophetic Vision'. He is also variously described as a rebel, orator, politician, journalist, poet and historian. After twice living in Boston, the latter time for 10 years after escaping from Ireland with a price on his head -- the Inishowen plaque is at the beach from which he made his escape -- he decided in 1857 that Canada could be a better place to settle. In the year following his move to Montreal, he was elected to the legislative assembly of the Province of Canada. He became a cabinet minister, but, by 1866, having alienated many Irish voters, he was dropped from the Cabinet. 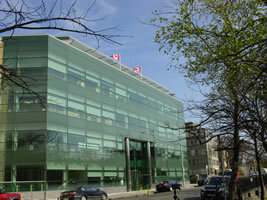 The Canadian Embassy offices (the Chancellery), the focus for services to and representation for Canadians living in and visiting Ireland, moved on July 1, 2007 to new offices at 7-8 Wilton Terrace, Dublin 2, a new office building beside the Grand Canal, 100 metres west of the Baggot Street Bridge, after more than 30 years in its previous location. Apart from focus provided by its physical location, the Embassy is also visible to key segments of Irish life through conferences/events at which the Ambassador speaks and performances/events the Embassy hosts. Of particular note is the Embassy's Trade section support for business development between Canada and Ireland: about 100 Canadian companies have an Irish presence and Canadian Foreign Direct Investment in Ireland -- 5th among all international locations -- is very high. The Embassy's Consular section is also a busy place, assisting Canadians with passport issues on a daily basis. And, of course, there are the many diplomatic interfaces, some ceremonial and some quite delicate, that the Ambassador and his staff undertake for Canada. For example, the Embassy is a leader in the diplomatic community in Ireland through its support on Canada's behalf of the work of the Glencree Centre for Reconciliation, whose contributions extend far beyond Ireland and Northern Ireland, as further noted in the County Wicklow section below. Three other things are worth noting here. On the bright side is the Working Holiday program between Canada and Ireland, which enables up to 2,500 Irish under 35 to travel, study and work in Canada for up to a year. Follow the link at www.canada.ie for details. A less happy note is that the Embassy has no mandate and no budget to promote Canada as a tourist destination. The Canadian Government's complete blind eye to Irish tourism potential is all the more unbelievable in view of the fact that more Irish travel out of Ireland each year than Ireland has visitors from abroad and there are generations of family connections between Ireland and Canada. Sadly, too, is that part of the Consular section's 'busyness' is due to the fact that many passports are lost or stolen. At peak times this is reported to average about one per day for Canadians visiting in Ireland. The stolen passport problem is, of course, not unique to any country and, with tourism being of huge importance to Ireland, an Irish Tourist Assistance Service -- www.itas.ie -- has been set up to offer advice and assistance to tourists who are victimised when visiting Ireland. Canadians visiting anywhere that requires their passport are cautioned to safeguard it at all times and, as a particular note of caution when visiting Ireland, to be extra vigilant in Dublin's city centre. 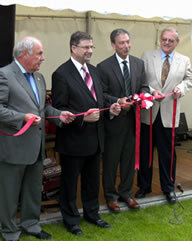 Glanmire, the (new) Official Residence of Canada's Ambassador to Ireland, formally opened on July 1, 2009, is located at 22 Oakley Road in the Dublin suburb of Ranelagh. Built in 1848, the building is steeped in Irish history, having been owned for close to 60 years by the Pearse family which included brothers Padraig (Patrick) and Willie who were leaders of the Easter Rising of 1916. Glanmire was undoubtedly the center of many important debates and actions around the pursuit of Republic status for Ireland and Padraig was recognized by many as the President of Ireland's Provisional Government. Both he and Willie were executed following the Rising's suppression. Glanmire was part of a larger farm where Padraig started the first St. Enda's Irish Boys school and St. Ita's Irish Girls school. The school, also known as Cullenswood House, was known to have been a 'safe haven' for Irish independence leaders such as Michael Collins. It was wrecked by the Black and Tans while searching for supporters of independence. Glanmire was eventually sold to the Department of Public Works and thence to a private owner, and, newly refurbished, to Canada. Unfortunately, because it is slightly off the beaten path, all too few have seen the Famine Memorial, the most touching of sculptures. Shown in the top picture, this work by renowned Dublin sculptor Rowan Gillespie is easy to reach, however - just a few blocks seaward from O'Connell Bridge along the quays on the North side of the Liffey. The Canadian connection with the site is marked by a large plaque recognizing a donation on behalf of the people of Canada, which was a haven for thousands of those who emigrated because of the Famine. Fortunately, Canadians who might not have the chance to visit the sculpture in Dublin can experience its counterpart in the new Ireland Park at Toronto's now-named Eirann Quay (formerly Bathurst Quay). There, on the shore of Lake Ontario, five figures collectively entitled 'The Arrival' honour the 38,000 Irish immigrants who fled during the Famine of 1847 and arrived that summer in Toronto when its population was a mere 20,000. 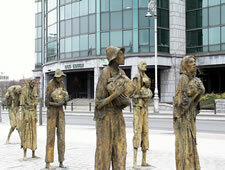 'The Arrival' is also the work of the sculptor of the Dublin memorial, Rowan Gillespie, who was on hand for the June 21, 2007 official opening of the Park by the President of Ireland, Mary McAleese. Ireland Park is a bridge that will link two nations and two cities. It is the story of a destitute people overcoming unimaginable hardship and suffering, and speaks to the kindness and generosity of Canadians, which is as consistent today as it was in 1847. It is a reminder of the trauma of famine, which still exists in many parts of the world today and the consequences of the rest of the world's failure to respond to it. The middle and lower photograph, which show the Ireland Park site, are presented courtesy of the photographer 'High Plains Drifter'. More photographs may be seen in his Ireland Park section at Flickr. More information about this outstanding memorial may be obtained at www.irelandparkfoundation.com. The Canadian flag has flown proudly above the castle for each ICS Canada Day picnic since 2004 (see ICS Calendar of Events). - Tara's Palace. The highlight of this priceless collection, located in the castle's courtyard, is a 22-roomed Dolls House inspired by the three great Georgian Mansions of 18th century Ireland. The quality and detail of its miniature furniture and fittings are as much an attraction for adults as for children. All proceeds from the nominal entrance fee go to children's charities. 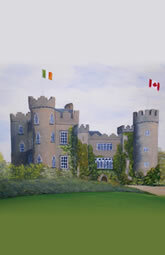 Canada's Tara's Palace connection is the limited edition Mountie doll presented to the exhibit's doll collection by the Irish Canadian Society on the occasion of its 2004 Canada Day picnic, held on Malahide Castle's grounds. - Fry Model Railway. One of the world's largest miniature railways (a working railway covering some 2,500 sq. feet), this unique collection of handmade models of Irish trains from the beginning of travel to modern times, is a treat for 'children of all ages'. Dominating the museum one passes through to the 'train' room is a massive model of a Canadian Pacific engine. Canada-Connected Retailers. The Canadian flag flies prominently at Grafton Street's Brown Thomas the Canadian-owned department store that, like its Canadian counterpart Holt Renfrew offers high-end merchandise. And, since a small start on May 5, 2005, Canadian icon Tim Horton's products have become increasingly available in Ireland, to the delight of the Canadian ex-pat community. Alcock and Brown Monument, about 3 km south of Clifden. This monument, in the shape of a wing of the plane, marks Alcock and Brown's historic first non-stop transatlantic flight, which began in Newfoundland in June, 1919. Situated hill near the Derrygimlagh Bog landing site, it is also close to the Marconi transmitter station. Marconi Transmitter Station. Near the Alcock and Brown monument site is the location of the turf-powered transmitter station from which Marconi exchanged the first transatlantic radio messages with a station in Nova Scotia, in 1907. 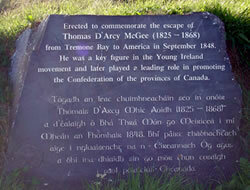 Thomas D'Arcy McGee plaque, Carlingford. Born in Carlingford in 1825, McGee is sometimes called Canada's most eloquent Father of Confederation, following upon his famous 1860 speech "A Prophetic Vision'. He is also variously described as a rebel, orator, politician, journalist, poet and historian. After two stints in Boston, the latter for 10 years after escaping from Ireland with a price on his head, he decided in 1857 that Canada could be a better place to settle. In the year following his move to Montreal, he was elected to the legislative assembly of the Province of Canada. He became a cabinet minister, but, by 1866, having alienated many Irish voters, he was dropped from the Cabinet. Oldcastle. Signs proclaiming the 1999 twinning with Oldcastle (Tecumseh), Ontario welcome you to this friendly town. It's well worth a visit to it and to its nearby ancient monuments and picturesque surrounding scenery. Enniscorthy. It's worth a trip to Enniscorthy just to see the "Home to Canada" sign as you enter it. Better yet, drop into a pub or coffee shop there and thank the locals for the wonderful hospitality you've heard their town gave to the Team Canada participants in the 2003 World Special Olympics. Cities and towns throughout the island hosted participating teams from throughout the world (the first time those events were held outside the US); there can never be enough said about the generous hospitality of the Irish hosts and volunteers who made the huge undertaking of the Games such a success. The Canada Room, Glencree Reconciliation Centre, Glencree - Through the Canadian Embassy in Dublin, Canada has been a major supporter of Glencree's internationally renowned role in helping parties to political and other conflicts to peacefully reconcile their differences. Its main meeting room, which has been furnished, with Canadian assistance, as a lounge rather than a boardroom to create a congenial atmosphere to promote dialogue, is named the Canada Room. Canadian artworks have also been generously contributed to the Room. They include Group of Seven prints contributed by the McMichael Gallery www.mcmichaelgallery.com, the Spiritual Home of the Group of Seven. Become a Glencree volunteer or intern. Glencree delivers its various programs through a small professional staff supported by volunteers who have come from Canada and more than 20 other countries. The volunteers are young people (typically between 18 and 30) who are committed to reconciliation and wish to help Glencree in its peace building work locally and globally. The volunteers diverse nationalities help to create an inclusive and non-judgemental atmosphere that mirrors the kind of society Glencree is trying to build. Glencree welcomes volunteers for periods of three, six and 12 months. Internships also form a valuable part of the work of Glencree and give prospective practitioner learners an opportunity to develop research and practical skills in a supportive and engaging environment. For more about Glencree volunteering and internships visit www.glencree.ie. 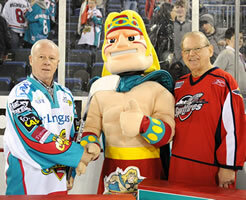 A lifelong hockey fan, Canada's Ambassador to Ireland, Loyola Hearn had an extra treat when he attended his first Giants game on March 5, 2011: ICS Chair Dave Wilson introduced him to the Giants' Finn McCool mascot. The Odyssey, Belfast. This magnificent complex (www.odysseyarena.com) is home to a number of Canadian connections: the Belfast Giants ice hockey team; the W5 Science Centre; and an IMAX theatre. - IMAX theatre. IMAX theatres are renowned for their Canadian based technology. 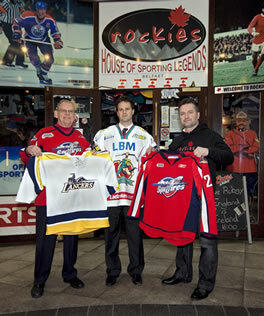 - Rockies sports bar: Canadian passion for hockey is everywhere! In fact, undoubtedly the finest display of game-worn, Canadian team hockey jerseys anywhere and a tourist magnet for Canadians living in and visiting Ireland and Northern Ireland is the Canadian-owned Rockies sports bar in Belfast's Odyssey entertainment multiplex (above). Over 200 team-donated jerseys are on display, including those from about 50 Canadian universities, almost all the OHL and many other Jr A teams and the NHL teams. There are also jerseys from a host of national teams and teams in European leagues. Marking the presentation of a jersey from the 2009 AND 2010 Memorial Cup Champion Windsor Spitfires are three Canadian ex-pats, from the left, Dave Wilson, formerly of Windsor, Ontario, Todd Kelman, formerly of Calgary, Alberta, and Jim Graves, formerly of Gimli, Manitoba. Dave, who lives in Dublin, is Chair of the all-island Irish Canadian Society. He regularly visits his hometown to cheer the Windsor Spitfires on and presented the Spitfires jersey to Jim, Rockies' owner, on the team's behalf. A graduate and professor emeritus of the University of Windsor, he is holding the Rockies' collection jersey from its hockey team, the Lancers. Jim and Todd live in Belfast. Jim played professional hockey in Europe, finishing with the Nottingham Panthers in 1993, and coached the Irish national team for several years. He owns and operates Rockies, an integral part of the Odyssey complex. Todd, who was a St Louis Blues pick in the 1993 NHL entry draft but opted to play in Europe instead, was the first player signed when the Giants were formed in 2000. Now the Giants GM, he also provides leadership to the Giants Community Foundation, which brings together youths from the two sides of Northern Ireland’s sectarian divide.